No, you may email what you require your spell to do. How long do results take to appear? Once a spell is cast it may work anytime, spells want to grant results as soon as possible, therefore your spell will work as fast as it can. Full results can take up to a couple of months, 4 weeks is about average, but many people get results within days or a few weeks. Each case varies, Andrea’s reading will give you a better idea how things will work for you - this is one reason why we include a reading, it gives you guidelines. No, we use full protection at all times. I am using another witch, nothing has happened, can I use you also? Yes, it would be wise. No genuine witch can - you should report back to us if nothing has happened, usually more time is required, but Andrea’s cards will reveal any problems when we review your case and write up your spell. We are able to test if a spell has been successfully cast; an even burning candle is called a 'successful burn.' We may find a heart shaped wax puddle, which is a very good omen when casting love spells. Quickly melting wax is another good sign for example. Do you supply email support? 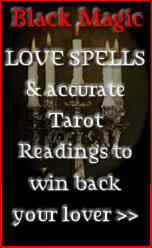 Yes of course, and we offer extra readings for those who find they need extra readings. How will I know my spell is working? Unless you witness changes visually you won’t know, but we test to see if a spell is working. Can I speak to you on the phone? We prefer our clients to write down their requirements - either by email or post. You do not have to do any witchcraft, but Andrea’s reading may have some easy to follow advice that will help you get results faster, although 99% of the time clients are advised to sit back and do nothing, to leave everything up to their spell. You are in the UK, I am not, will my spell still work? Distance does not effect our work, we have clients worldwide.